This looks like it’ll be a great event – being run by the people at Access Events see below for more info. They’re doing all they can to make sure the day is as accessible and enjoyable for all so if you’re in the Birmingham area it looks like an event not to be missed. 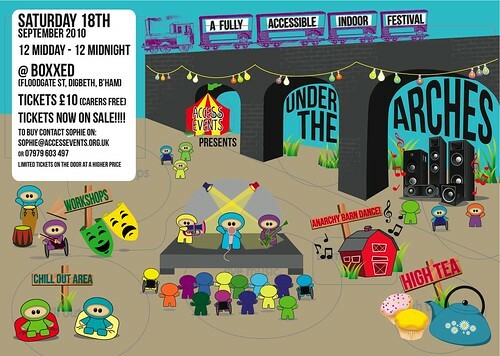 Under The Arches is a one-day festival in Birmingham City Centre designed especially for people with learning and physical disabilities, their friends and their carers. Our warehouse venue will have fully accessible toilets and changing spaces with hoists. Personalised and sensitive support will be offered to visitors before and during the event. Visitors are invited to bring along their non-disabled friends, for an open and inclusive atmosphere. Some bursary tickets and subsidies for travel / accommodation are available. Access Events is a small charity that puts on events that are attractive and welcoming – as well as accessible – to people with learning and physical disabilities. We do this because we don’t think that enough people with disabilities have the chance to go to watch live music or attend other social events. We don’t think that it is fair that many people with disabilities don’t get to plan their own social activities. Following our September launch event, we will set up a steering group of people with disabilities (with advocates), which will tell us what sort of events to organise in the future. We also encourage people with disabilities to organise and work at each event. We are hoping to create a lasting impact by building connections amongst the people who attend our events, and would like to foster a social change by empowering our guests to try other public events which may previously have seemed intimidating. If you are interested in getting involved with Access Events in any way, please let us know! We will need volunteers on the day to check tickets, help organize activities, and to help us make sure that the festival runs smoothly.